Terrifyingly it is nearly nine years since the production of the first catalogue ( DH Comet) and six since the last (Heathrow). If imitation is a form of flattery then I supposed I ought to be vauguely pleased that persons unknown were selling bootleg copies at the Frankfurt show. As these were poor black and white photo-copies on offer at EUR 5 ( £3.5 and rising) they do not really compare. I would like to be able to say that quality reprints are still available in full colour but, as the masters were lost in a computer crash about 7 years ago this is only true of the Heathrow one. The others ARE available but sourced on scans of the originals. What anybody who buys the pirated copies will NOT get is the update service. Indeed many members may have forgotten about it. The listing parts of all catalogues have been maintained with information about new finds and new issues. 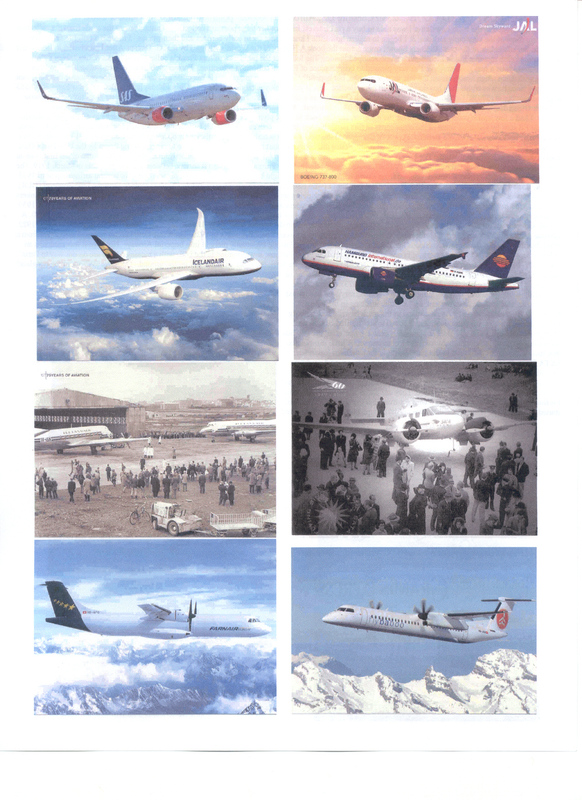 Even though the Comet ( although not the Nimrod) is extinct in the air, as also is the civil VC-10 and the BAC-111 heading that way, new and retrospective cards are still being issued and new finds of old cards being made. For latest versions of all listings , send an E-mail for an electronic copy or 2 x 48p stamps for mailed copies within UK. As to produce any of these will require the contributors to supply images then it is only worth doing if there is a demand so I am including some questions with the renewal forms in this issue. Lastly, something which could have been in What do you Know ? In updating Heathrow I realised that I am not sure how many BAA Terminal 5 sets were issued. I know of two – the first is mainly of construction work including one with a BA Concorde passing – the second shows buildings largely complete and has a T5 logo on the face. Does anybody know of more ? Hopefully there will be more when it opens in 2008 – but , as is the current fashion, probably showing more car parks than airliners. Meanwhile here are some new issues or finds of catalogue subjects included in updates. What could be more conducive to postcard sales than a location which involves a lot of waiting around before or after an experience which most writers had never experienced before. 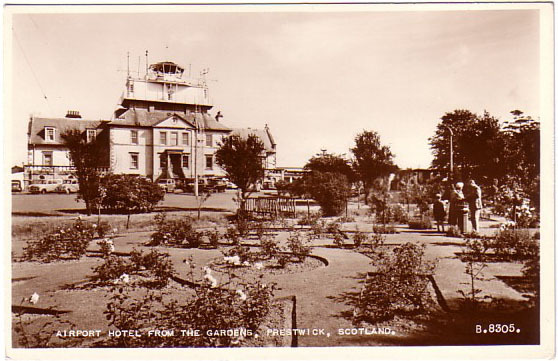 Then set this in a holiday resort area with unreliable weather and make it the only place in the Uk outside London visited by Transatlantic air services This must explain why there are so many cards of Prestwick airport on the SW coast of Scotland and why so many that have survived have messages. While many are from passengers offloaded during re-fuelling, as many are from visitors there just to watch. This route map card ( Valentine D1774) shows just how well connected this Ayrshire town was. 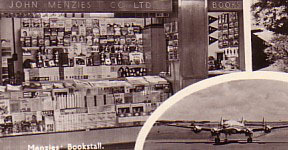 Prestwick also nearly provides an example of the classic “infinity” card – i.e the card has a picture of the same card , on which there is a picture of the same card etc etc………… Not quite, but on an M&L 4 view card there is a picture of John Menzies shop which has a postcard rack on which there were doubtless many airport cards – the enlargement also includes the centre BOAC Constellation view. 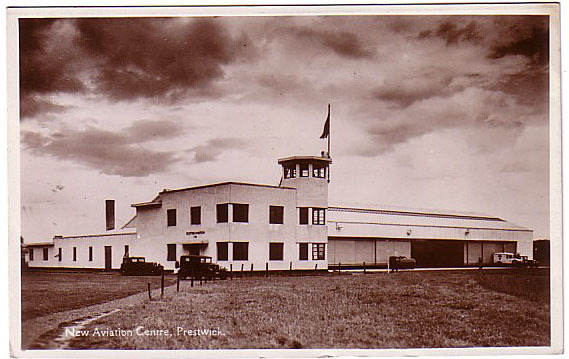 Scottish Aviation Ltd was established at Prestwick in 1935 as a state-of-the-art training facility with purpose built buildings in the latest style It housed No 12 Elementary Flying Training School. 50 years later 2 sets of cards were issued for the anniversary but this is an original anonymous card of the then new buildings. During WW2 Prestwick became established as the UK end of the North Atlantic ferry and transport routes. In 1941 the buildings were added to by the import of the Palace of Engineering from the 1938 Glasgow Exhibition , which still survives on site. By contrast, a post war expansion took over late 17th century Orangefield House , which with some additions to the roof , became probably the worlds only 17th century control tower and also doubled as the airport hotel as on this further Valentine card B8305. It was demolished in 1966 . Part of the floor was re-sited in the new airport function room. Scottish Aviation also operated an airline 1946-60, starting with the inevitable DC-3 s but also a few Liberators. This one is a blow-up from another Valentine card, 4 view B.8, mailed 1948 by someone who has had “a lovely weekend at Troon” and “ at least you get a good lunch at the airport” . At this time the airport hosted transatlantic traffic from BOAC, Trans Canada PanAm, KLM and SAS., which attracted viewers to the rather basic public enclosure. 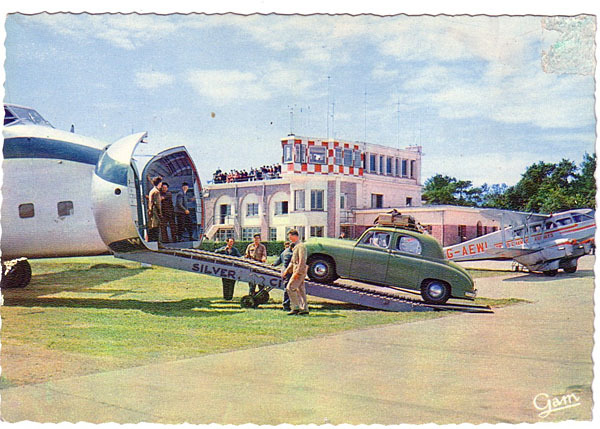 A pleasure flyingRapide features with KLM Connie, PAA DC-6b & BOAC Stratocruiser on this one, again Valentine, D3062, mailed 1961 “Just got my baggage checked in” – probably on a 707 by then. Rapide ‘LPK was with Air Taxi Cumberland. It is seen in situ at the enclosure with a Scottish DC-3 on Valentine B8308 together with the ubiquitous Ministry of Aviation steel chairs. 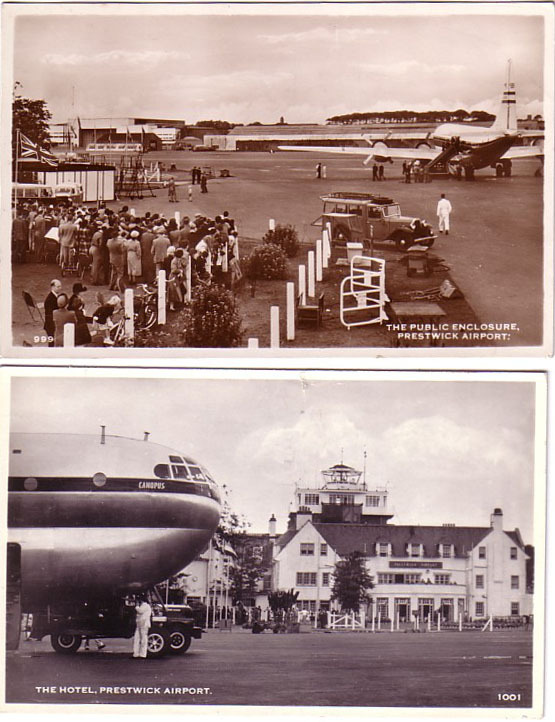 Another enclosure view from Hendersons , 999, shows a BOAC Stratocruiser and, left distant the white transplanted Palace of Engineering building – “Saw plenty of planes, super types…” wrote Paul to Master Hamilton” in 1957. 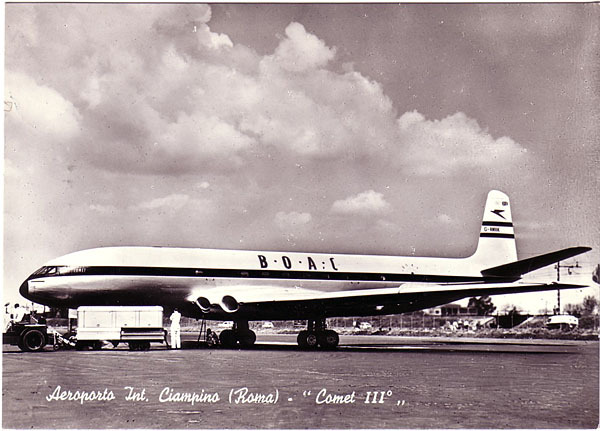 Below 1001, from the same series shows where the tower/terminal/hotel would have been in relation to the nose of the same Stratocruiser –and also identifies it as G-AKGK Canopus. – the second was not mailed until 1962 and only has holiday weather news. 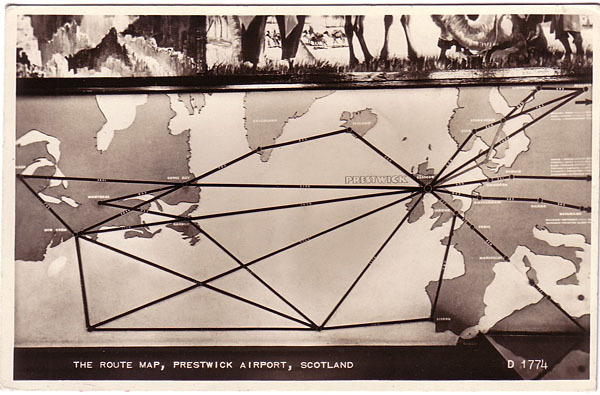 With the considerable connections between Scotland and Canada, Prestwick would have been a destination rather then a transit stop for many Canadian passengers. 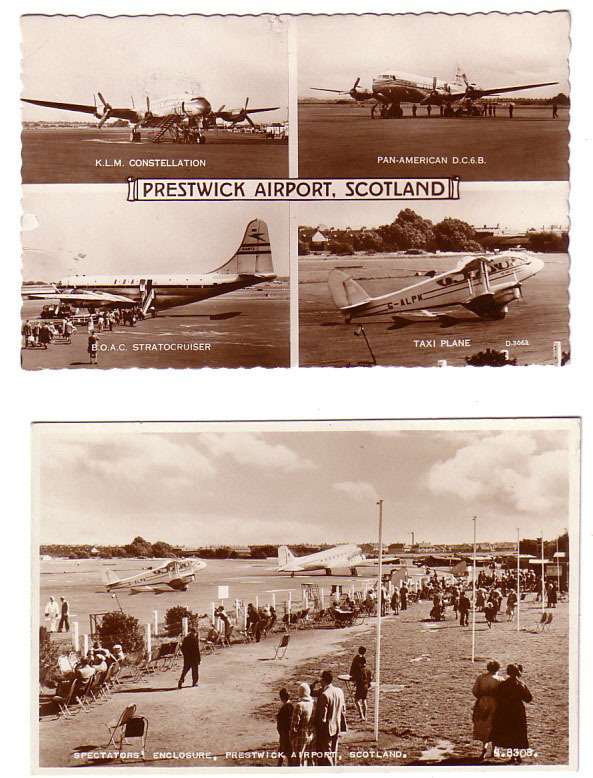 Firstly , a Trans Canada DC-4M is on an M& L card, mailed 1953 to Germany with ( in German) “Greetings from our first landing on the homeward trip, Prestwick Airport, Scotland” – I would guess they were on PanAm. 11 years later, “Michael” was “watching the aircraft coming and going” when writing to Mum & Dad in nelson, Lancs. By then TCA had passed through Super Constellations and on to DC-8s – but the 18th century tower was still there on Valentine D6599. To be continued into the colour-card era………………. There’s something about the Boeing 707 that has always captured my interest. Maybe it’s because I am from the generation where the big jets made their first appearance, maybe it’s the sleek lines of the -320B/C series, or images of the 707’s strength and endurance from the movie Airport (with Captain Demarest, no less!). 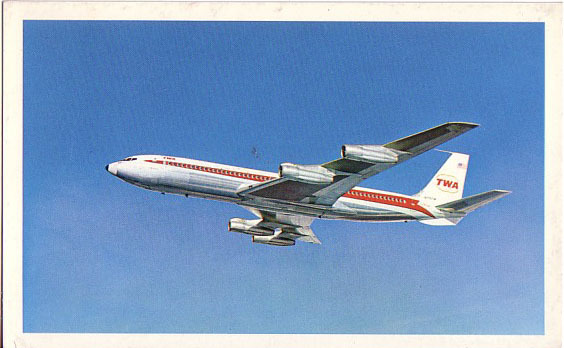 Regardless, I have always had a soft spot for the big plane and have focused my postcard collecting efforts on Boeing’s first commercial jet aircraft. My collection numbers over 950 different airline and airport issued Boeing 707 postcards. For various reasons, among them lack of space and finances, I tend to shy away from publisher issued postcards. So, let’s take a look at some of my favourite 707 postcards. 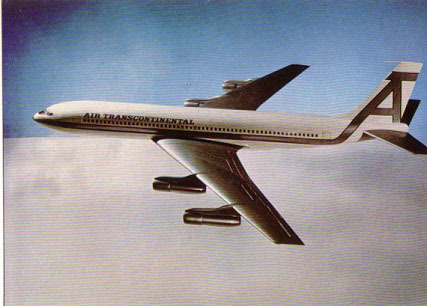 AIR FLORIDA Nowadays who would fly an aircraft as large as a 707 on intra-state routes? Times have changed. Thankfully, so have our hair and clothes styles. Next, AIR TRANSCONTINENTAL. 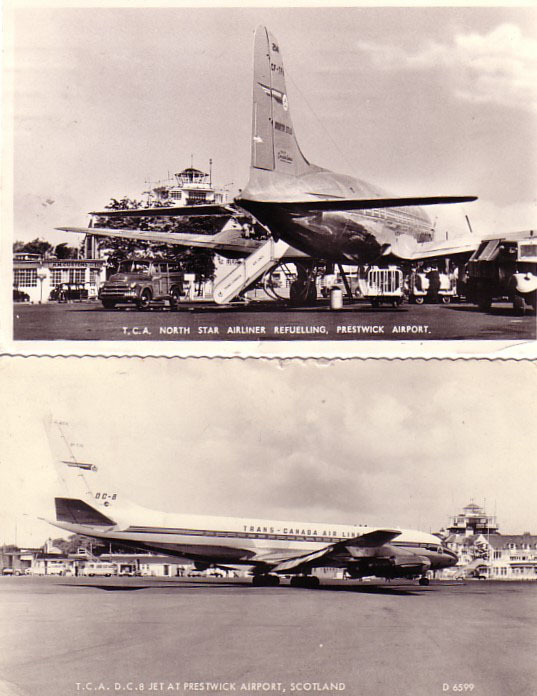 Admittedly I didn’t know much about the background behind this carrier except that Air Transcontinental was a short-lived British charter operator it was so short lived that it never operated but did this card of a model plus one of another set of stews in more traditional outfits than the Air Florida crew. 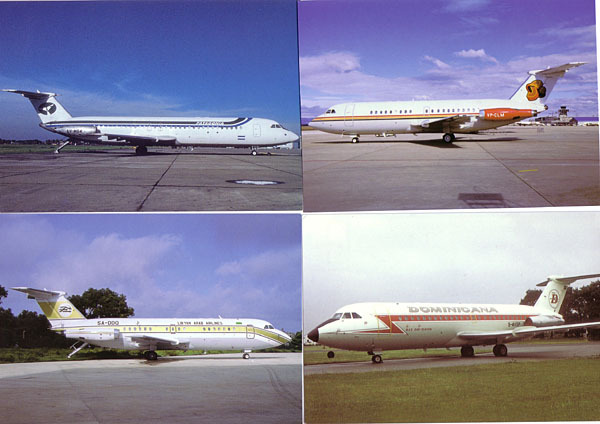 By contrast BOAC and its ancestors and successors have been around for a while. I like action shots where you can easily imagine yourself as part of the scene. 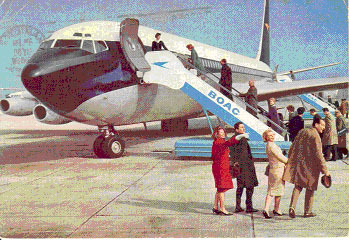 This BOAC postcard captures the moment when air travel was an adventure and people dressed up for the event. Nowadays, sandals and t-shirts are the uniform de jour. An airline of similar vintage but with a break of service from 1945-54 LUFTHANSA. . 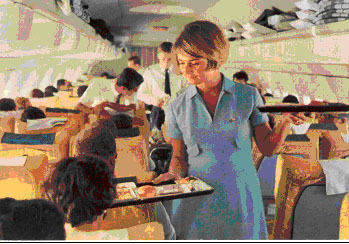 Unlike most food on airline postcards this one seems distinctly economy class but they did get free food – remember! 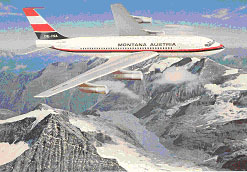 Believe it or not, Austria had two carriers who flew Boeing 707 aircraft – Austrian and MONTANA AUSTRIA. 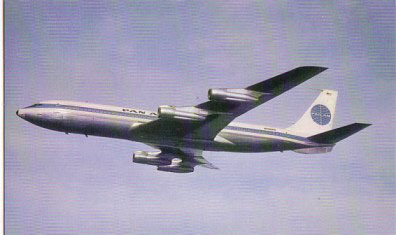 This was an ex Qantas short-body -138. Montana ran afoul of the law with another – something to do with the arms trade. . This was not unknown among late-user 707s in more obscure parts of the world but in this case US Customs were on to it. I can’t let a 707 piece go without two classic views from two classic rival airlines, both now long gone. PAN AM and TWA. Both say it all – its sleek, its fast and its ready to carry YOU to anywhere in the world. 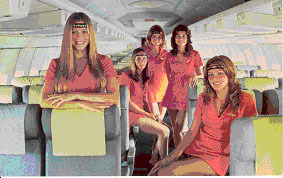 The first 707 jet for any airline was a BIG event . 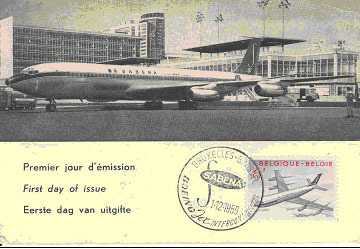 Belgian SABENA celebrated the arrival of their first 707 in 1959 by issuing a first day issue stamp and, luckily for us, a postcard. Finally another action shot where the people fix the 707 firmly in its time. Another flashback to one of the golden days of air travel – this time in South Africa. 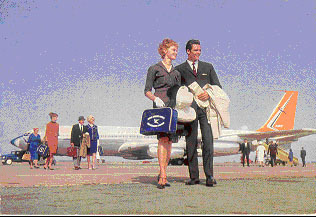 Nowadays you would never see passengers walking unescorted out to the aircraft – or all-European SAA publicity. 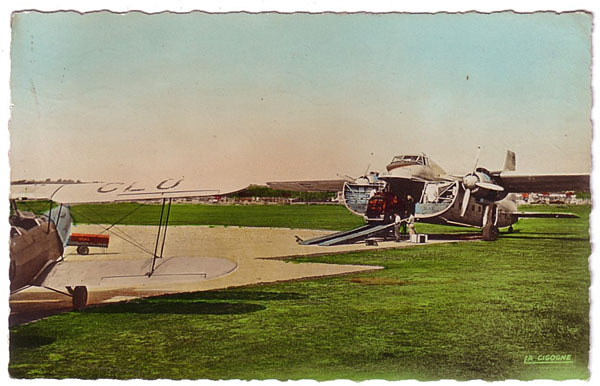 Airport postcard collectors are aware that France's Le Touquet airport is depicted on a large selection of different subjects produced by several publishers. This is in spite of the small size of the airfield even at the peak of its ferry operations .It is easy to suppose that the rather unusual kind of airborne operations was the main reason, together with the existence of the nearby Paris-Plage, a popular sea-holidays resort. In fact we do not have such a comprehensive range of issues on the British side of the Channel, although again Lydd Ferryfield, the specialist ferry airport has a disproportionate number of cards. Recently, in a frantic last-minute trading with a French aviation fan, I got two Le Touquet cards which would best balance what he wanted to get from me. Both were cards that I was considering to put up for trade again. So, it was with some surprise that, back at home, I discovered unusual features on both of them that are worth further comments. CARD ONE – Printed in colour, it was issued by Gambier ("Gam" trademark) of Etaples, Pas-de-Calais department, #328. It shows the forward section of a Silver City B-170 with its door opened to accommodate a car. In the background is a DH.89 with an unusual title: Trans Channel Airways. Trans Channel Airways Ltd. was a paper airline: in fact it was just a registered name under which Air Kruise grouped passengers schedules from Lympne to Le Touquet and Ostend. 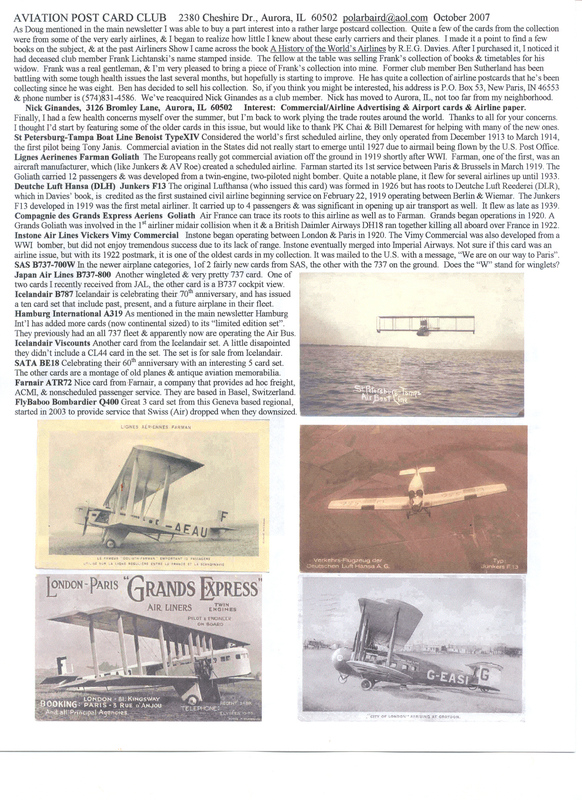 These services were flown by DH.89As which carried "Air Kruise" titles on port side and "Trans Channel Airways" on the starboard side. In mid-1953 (unconfirmed) such operations were enhanced adding a Ramsgate-Lympne leg. 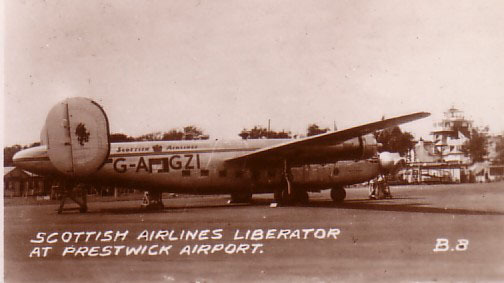 In 1955 Lydd replaced the latter as the main British terminal. All this went unchanged until 1958, when the whole Air Kruise fleet was gradually transferred to Silver City Airways "Southern Division". This was the major operating airline within British Aviation Services group, a holding company which had bought into Air Kruise back in 1953. DH.89A G-AEWL was with Air Kruise from spring 1950 to the very beginning of 1956. So, we can figure the approximate age of the picture. The car being loaded is also a bit uncommon, a British Singer SM1500 1948-54. The second card was printed by André Leconte (a familiar name because of its comprehensive "P.I." set) and issued by the well-known publisher "La Cigogne" (later taken over by Editions Hachette group). It is tinted and has 0106 numerical code. Again it shows a B-170 loading a car, with a Stampe biplane foreground. Titles are not sharp but readable: SCAL. SCAL-Société Commerciale Aérienne du Littoral was a French airline headquartered in Paris and based at Toussus-le-Noble airfield. Set up in 1950 it was to be the air transport branch of Boussac group of companies. During 1951 summer months (and, apparently, again in 1952) they operated a semi-regular car ferry service between Le Touquet and Lympne. A single F-BCJM registered B-170 was duly leased from TAI. Again, card dating is easy. In mid '50s SCAL operations were taken over by CAT.